This summer/fall I also upgraded my sewing machines. I bought a Bernina for piecing to replace my Janome. I bought a Juki for quilting lap and smaller quilts on. I bought a featherweight for taking to classes. I traded in my Babylock that I used to take to classes when I bought the Bernina. I know this is confusing to follow...but suffice it to say, sewing machine wise, I am in a much better place. I had also bought a older singer for $35 and then had it serviced, but did not realize the light was broken off. So I need to sell my older singer and my Janome. Everything is ready to go except that the Featherweight needs servicing. I will need to take it over to Starkville to Richard Vasik the featherweight doctor. I brought the Juki home yesterday and had to enlarge the opening just a little so it would fit in...so out came the saber saw and it really went pretty well. I am pretty excited about having the set up I have wanted for a while. 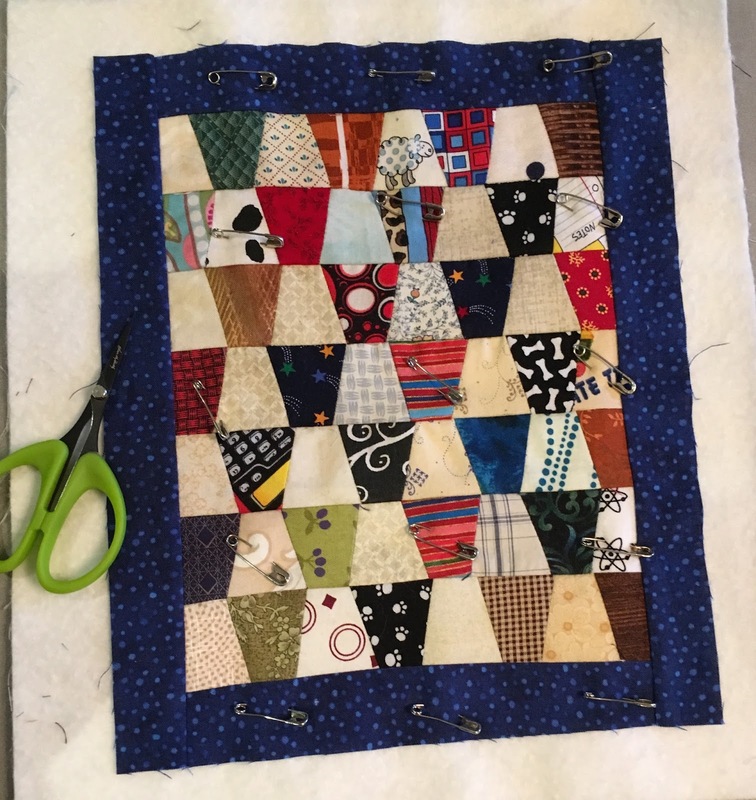 The Juki has a larger throat than the Bernina to accommodate more of a quilt. It also has easy drop down feet for free motion quilting and was recommended by Sharon Schambers to one of my friends who took her class as a good machine for sit down quilting. I also put up a shelf in the bedroom, while I had the tools out. That, cleaning bathrooms, dealing with a clogged drain and a few other things and all of a sudden the day is gone. At least tomorrow is a day off....whew I need it. After I got home from my travels, my air conditioner died. Well here in Mississippi, in July, that means you have to find another place to stay. Normally it takes a couple of days, but because the ac man's son was having surgery it ended up taking about 2 weeks. I was hanging out with my son in Tupelo while we were waiting on it to be fixed. Well, since I was at his house, I mowed his grass on Friday so we would have the weekend to play. I had wanted to go to Tennessee to get some of the Row by Row kits and license plates. I have also never been to the civil war battle fields in Corinth and I thought Will would enjoy that. When we first got out of the car and started walking up to the visitors center of the National Park at Corinth commemorating the battle of Shiloh, there were mini sculptures of things soldiers would have had with them scattered along the walk, as if they had been lost or abandoned during battle. I will admit it brought a lump to my throat to think of all the lives lost there. After we toured the museum we watched a demo on how to shoot a musket...and on our way back to the car we passed this plaque that reminds of the good that came from that conflict... to read more about the National Park or plan a visit click here. After we left the battle field we drove to Jackson, TN and then to Memphis to look for license plates and kits. Some stores were out but some were fun. We tried to end by going to the new Bass Pro Shop in the pyramid but we couldn't find parking so we headed back to Tupelo. Will was mighty nice to go to three quilt shops with me. Thanks son! 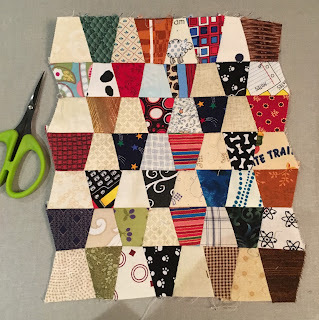 When I left Celeste, I decided to stop at quilt shops between Colorado and Mississippi. But because I didn't want to take forever to get home, I decided to target shops in smaller cities that were close to the interstate. I was collecting the patterns and the license plates from the shops participating in the Row by Row program. It was a fun way to break up crossing the heartland. It had been years since I had taken that route, and I really enjoyed the drive even if it was not dramatic in the usual since of the word. I was continually amazed at how far you could see. I was blessed with beautiful blue skys that seemed to go on forever. America is truly beautiful in every state. One of the highlights of the drive home was a stop at Missouri Star Quilt Company. I had a nice time there. There are a 5 stores there that you can shop at, and I think I found things I "needed" in all of them. Here is a link to a video tour that someone posted on youtube. That will give you a better idea of what is there better than I can. I got a picture with Jenny Doan!! After I left Hamilton I headed over to the Mississippi to get on 55 to head South. I went a little out of the way to see the arch. I wanted to get out and try to get to the top, but there was a Cardinals game and construction at the Arch park. Combined they created so much traffic and so little parking that I decided to keep on rolling. While I had a wonderful trip, I was glad to get home and see my fur babies. Almost all the work from the contractors was done and I was able to start setting up my home!! It was a wonderful summer!! Last June I went to a quilt show offered by the National Quilt Association. It is a smaller show than some of the others. Some friends and I met there and took some classes and went through the show. It was delightful. Judy Stokes had some quilts that had been accepted into a juried show and so did another friend of mine Julia Graber. 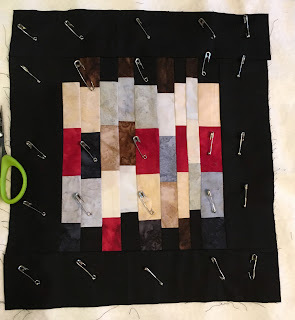 So we wanted to see them and Lauren and I wanted to take a class on modern quilting as we are both a little perfectionist, at times, which stops us from producing because it is hard to be perfect. 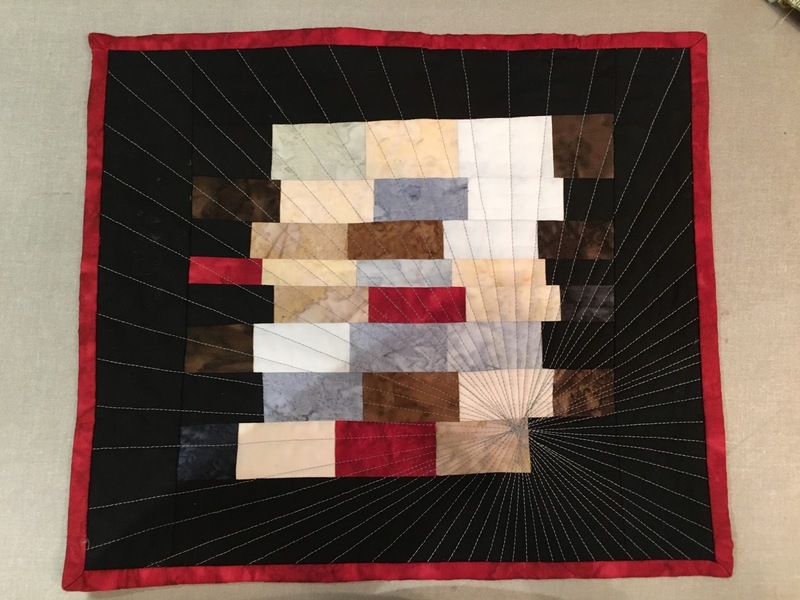 Julia won an award for this quilt https://www.facebook.com/nqaquilts. So proud of both of these ladies. Lauren, Eva Marie (Judy's sister) and I all enjoyed our class with Christa Watson. Here is a link to her blog. 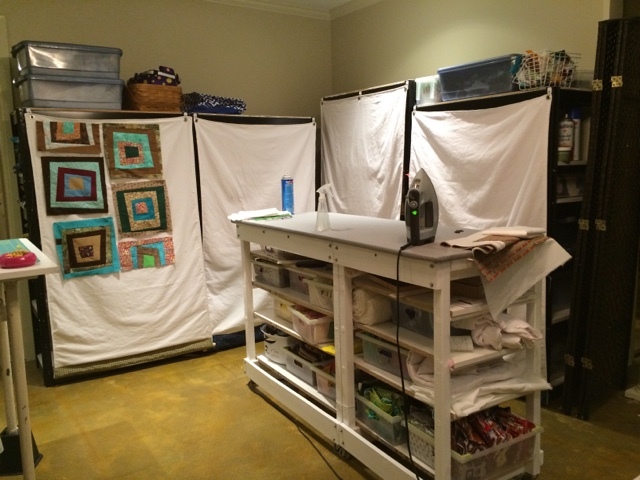 There are links to the classes she teaches and in her shop has her patterns and other things for sale. She is a very encouraging and fun teacher. 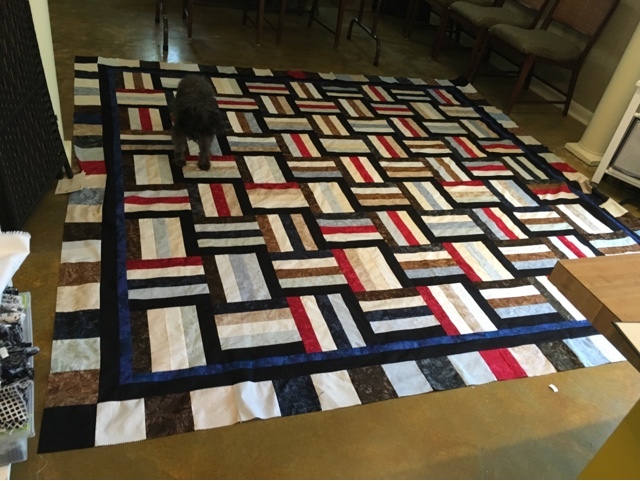 Anyway, Lauren was making a quilt in Red, White and Blue for use for picnics, tail gating and the 4th of July. 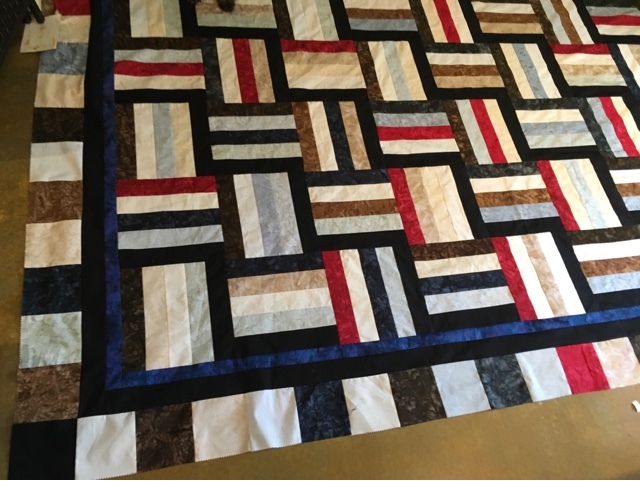 Lauren is an Ole Miss Grad so she picked the patriotic/Ole Miss colors for her quilts. I decided to do mine in teals, browns and a little red thrown in for fun. I waited too late to write this as I cannot remember Eva Marie's colors. 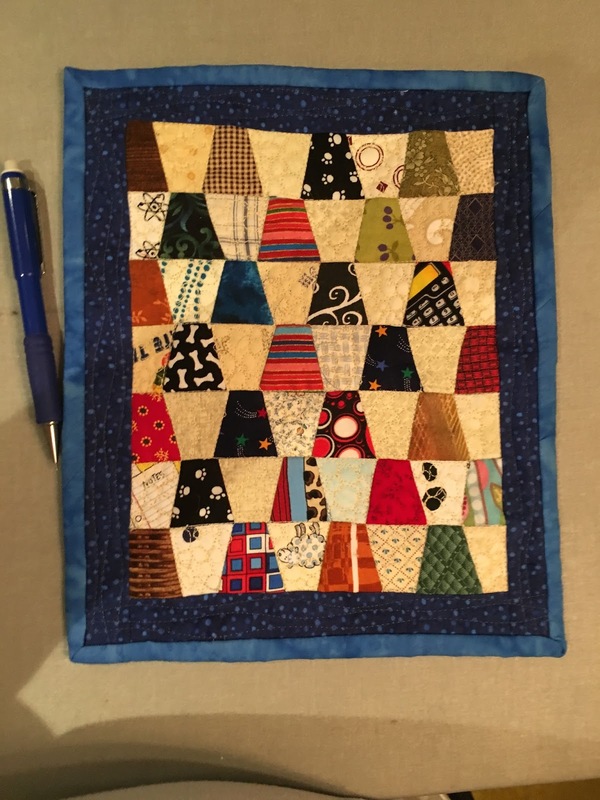 Eva Marie has finished her quilt but I have not seen it. I did not take near enough photos on this trip!! Christ with her sample quilt. Lauren's and mine are still in the WIP (work in progress) stage. When I can get to it, I really liked the process. It is really freeing. There are mine on my design cover (wall). 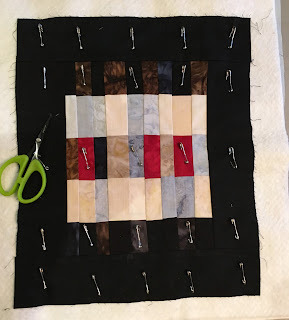 I was hoping to have the quilt finished before writing this post. But decided to go ahead and write it before I forgot everything I saw. Weight is still the same...no progress and no backsliding. I am going to have to add exercise if it is to move more....sigh. This summer I took a road trip. I had some things I wanted to take to my daughter out in Colorado so I didn't want to fly. 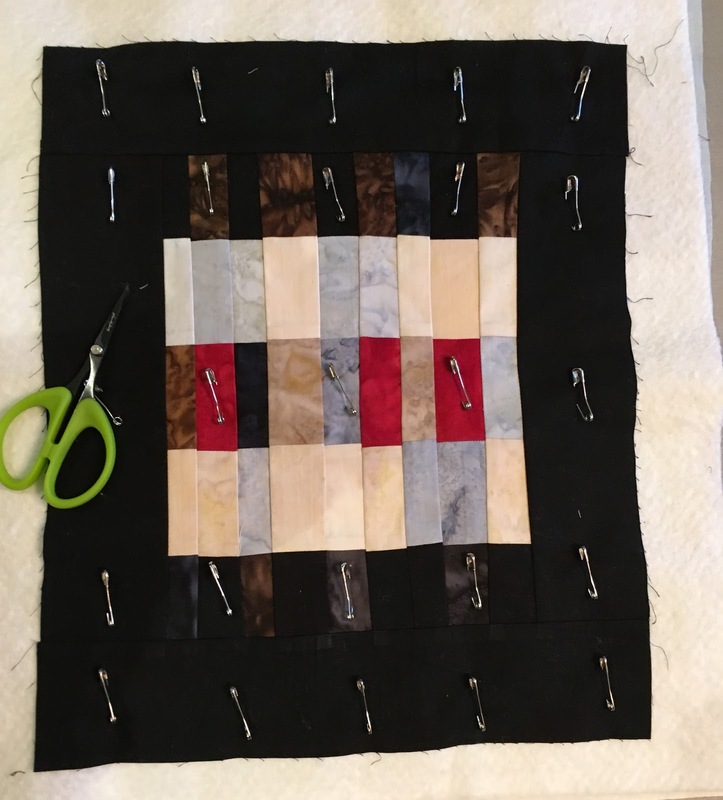 I also had a trip planned to go to the National Quilt Show in Little Rock and since I was that far, I had decided to go on to Colorado. Celeste, my daughter, needed to get some work done on her car, so we could use mine while hers was in the shop. On the way there I did not stop at Row by Row quilt shops as the program had not started yet. Celeste let me sleep in her room and she took the couch...After the first night, I knew something needed to be done. There is a security light on the building next door, directly opposite her bedroom window and even with the blinds down, I believe you could read by the light. Yes it is that bright. So the next day Celeste and I went to the fabric store and bought the supplies to make Roman shades. We found a great buy on the remnant table. That makes it even more exciting. Celeste has two windows. A small one in the corner and a larger one over the bed. We decided the shades should hang inside the frames, but on hindsight it would have been even darker in the room with them on the outside of the frames. It was a big improvement, but a bright sliver of light makes it though. It wasn't all work and projects. Celeste and I had a couple of nice dinners out and a really good smoothie at a place near where she had a dentist appointment. I also had time to drive around and get lots of kits and plates in the Denver area for the Row by Row. It was fun to visit quilt shops and get an idea about what is available in the area. One day I drove out to Golden and went to the shop there and the Rocky Mountain Quilt Museum. 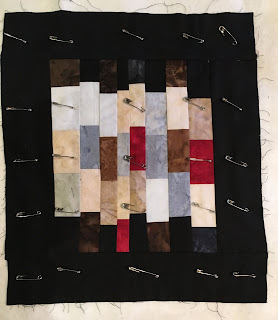 I had just come from the Little Rock Quilt Show where I had taken a class on Modern quilting, which will be another post for another day, and they had a portion of the exhibit in July was on modern quilting. The picture above was my favorite. 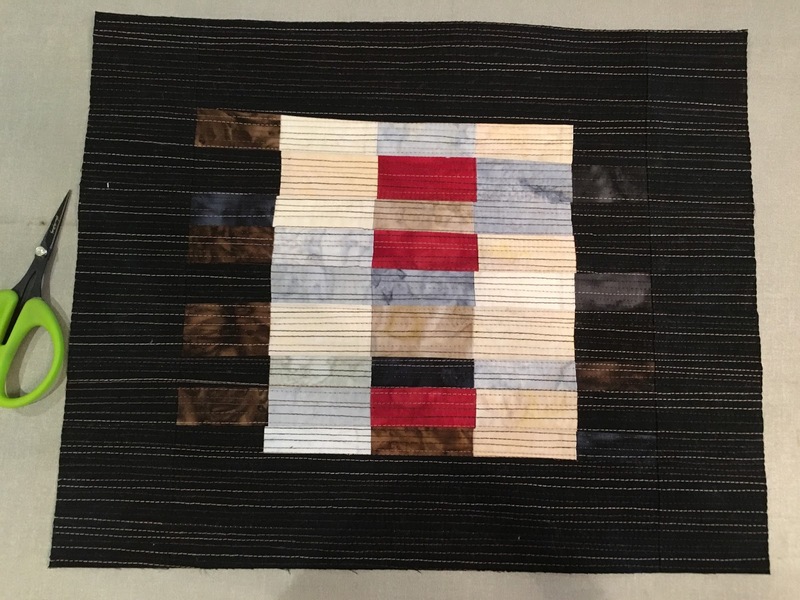 They also had an amazing exhibit of quilts that honored Native Americans. 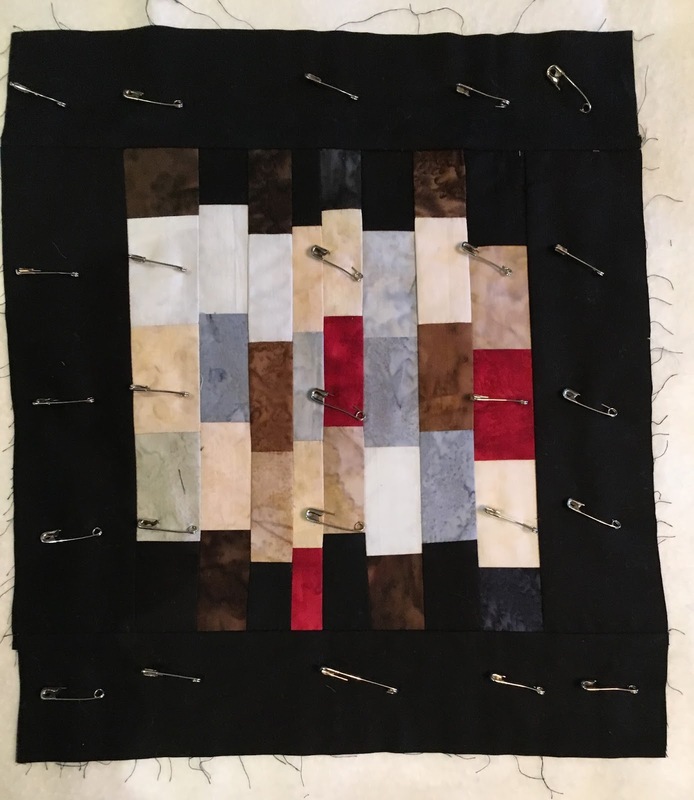 The quilting was truly amazing. I'm not guaranteeing you would see these things if you went by, but if you are in the area, it is worth stopping. After visiting the museum and the shop across the street, I stopped at a sandwich place and picked up a sandwich and took it to the top of Lookout Mountain and had a picnic. This makes me miss my girl, she is so much fun and so smart. Next post...I will tell about the trip home.